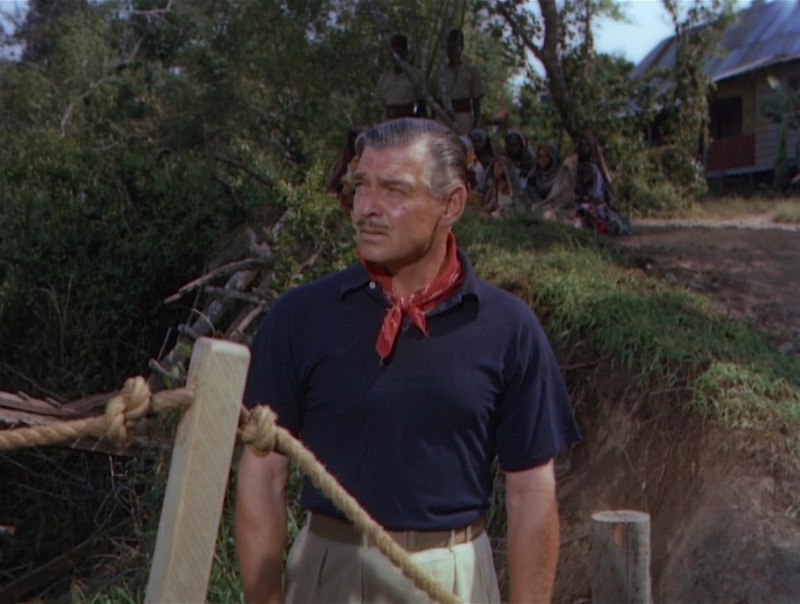 The cast was relatively new to director John Ford, who had cultivated his “stock company” over four decades of filmmaking with familiar faces like John Wayne, Ward Bond, Harry Carey, and of course, the director’s brother Francis Ford. 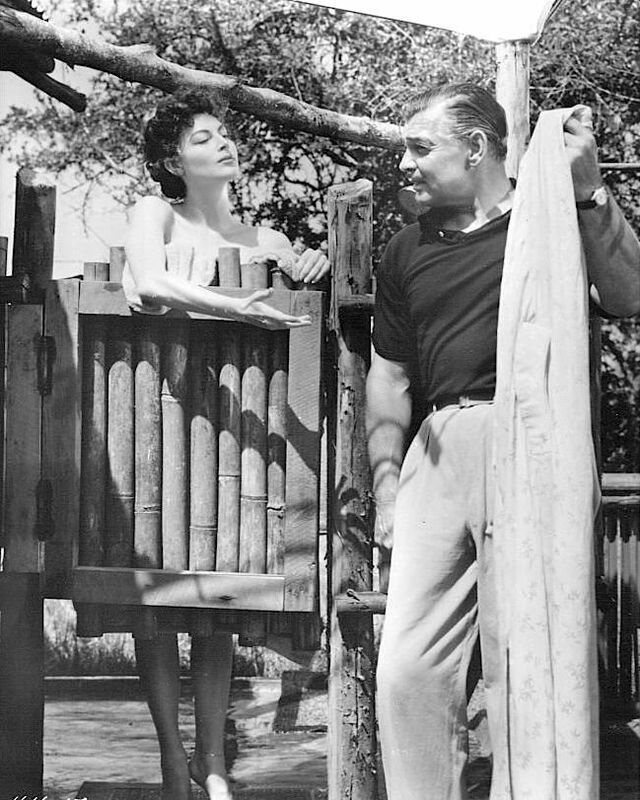 Ava Gardner and Clark Gable on set and in character during filming of Mogambo. His character is unreasonably upset after finding her using his shower. 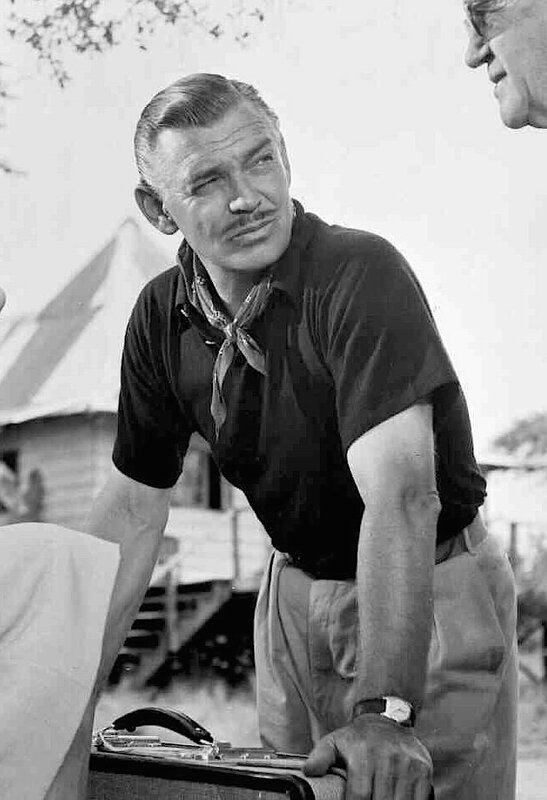 Mogambo would be John Ford’s only collaboration with Clark Gable, who reportedly did not get along with the director and once walked off the set to protest Ford’s treatment of Ava Gardner. 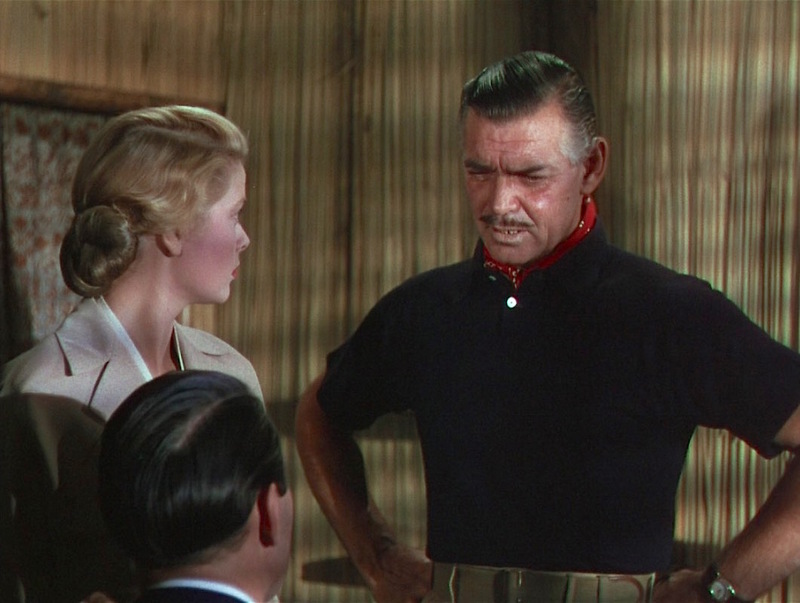 However, Gable was certainly the center of enough off-screen drama of his own from his affair with the much-younger Grace Kelly to his insistence that any male cast or crew member with more hair on his chest than Gable be forced to shave it off any day that the more hirsute man would appear shirtless on set. Gable had little to worry about when it came to his on-screen image, however. Mogambo begins with his character, Victor Marswell, wakened with news of a black leopard to be captured. With little time to lose, Victor leaps from his tent, grabs his Winchester Model 70 rifle, and leads the hunt. Unfortunately, the oafish Boltchak (Eric Pohlmann) blows their chance at bagging the black panther, and a grumpy Victor returns to his abode where he is… uh, frustrated? upon finding Eloise “Honey Bear” Kelly (Ava Gardner) using his shower. Out here, we have three antidotes for everything: quinine, iodine, and castor oil. Victor Marswell’s chosen profession as a big game hunter warrants the frequent wearing of khaki safari attire, which will be featured in its own post later this year. When not dressed for the hunt, Victor’s go-to casual wear consists of a comfortable navy-colored cotton-knit polo shirt. The short-sleeve polo shirt has a large, soft collar and two white mother-of-pearl buttons. Later, when the Nordleys arrive, Victor wears a red cotton bandanna tied around his neck, first sticking out of his shirt then tucked into the shirt under the fastened second button. The kerchief is patterned in the traditional white-and-black paisley on a red ground. 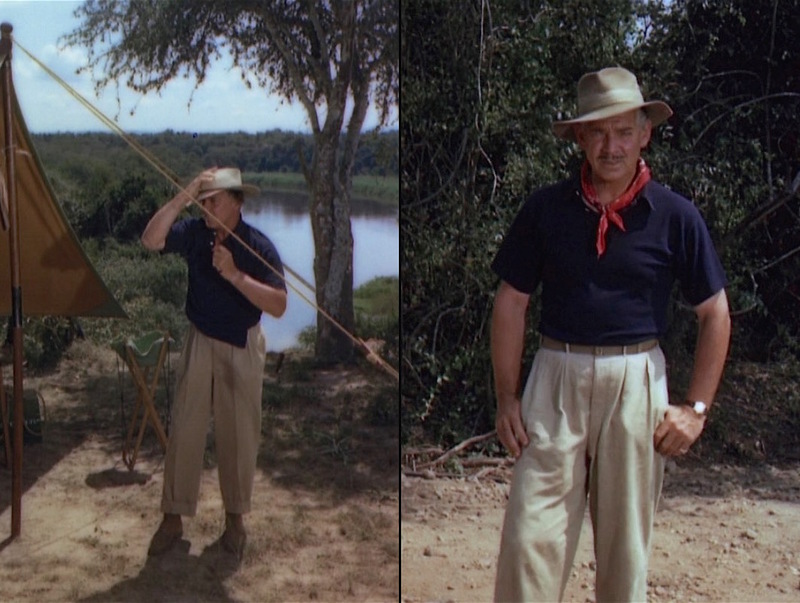 Victor wears the same pleated khaki trousers that he often wears with his safari garb. These full-fitting slacks have a high rise with tall, slim belt loops and double forward-facing pleats on each side. The trousers have slightly slanted side pockets, two jetted button-through pockets just under the rear belt line, and the bottoms are finished with turn-ups (cuffs). 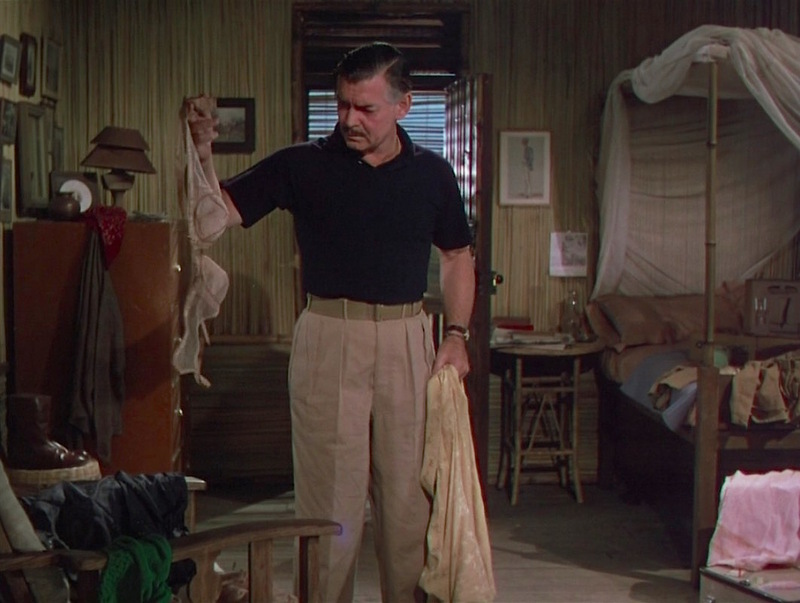 Victor finds underwear in his room that is decidedly not his own. Victor’s wide web belt is more of a true khaki color than his tan trousers, and the edges are trimmed in brown leather. The belt fastens with a slim brass buckle. Victor makes the acquaintance of the Nardleys, now with his bandanna tucked into his shirt. 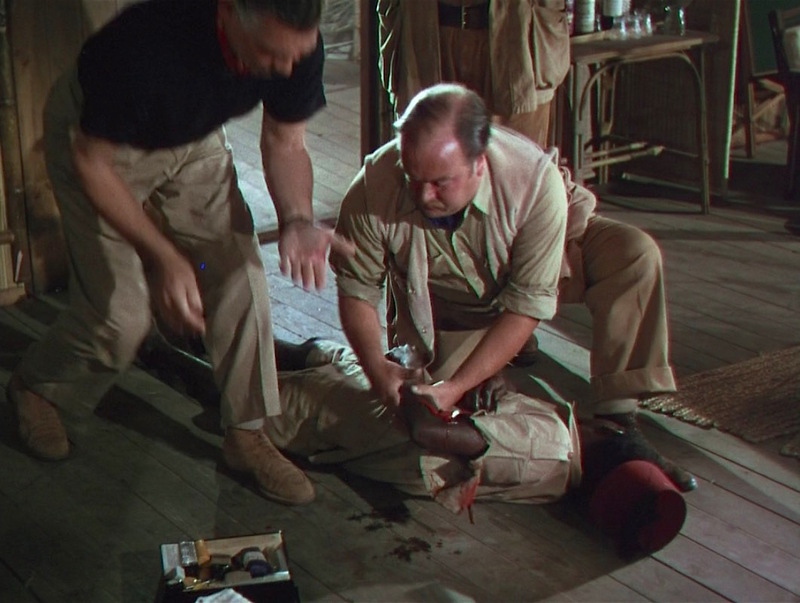 Victor’s brown suede boots are the subject of a few continuity errors as the shade alternates throughout the scenes from a light sand-colored suede to a richer tobacco brown suede, as well as a shot during the initial panther hunt that shows them to be a darker chocolate calf leather. His most frequently seen boots are the lighter sand-colored suede ankle-high boots with derby lacing and a moc toe-box. Though he wears mustard-gold cotton lisle socks, the tops of the boots are also covered with gray leg-warmers in some scenes. First aid, courtesy of Victor Marswell and John Brown-Pryce (Philip Stainton). Another continuity error can be linked to Gable’s wrist. When Victor Marswell first awakens in his tent, he isn’t wearing a watch, but the next shot suddenly shows him to be wearing a gold tank watch on a brown leather strap. Is it the same Cartier Tank he wore two decades earlier when playing essentially the same role in Red Dust? 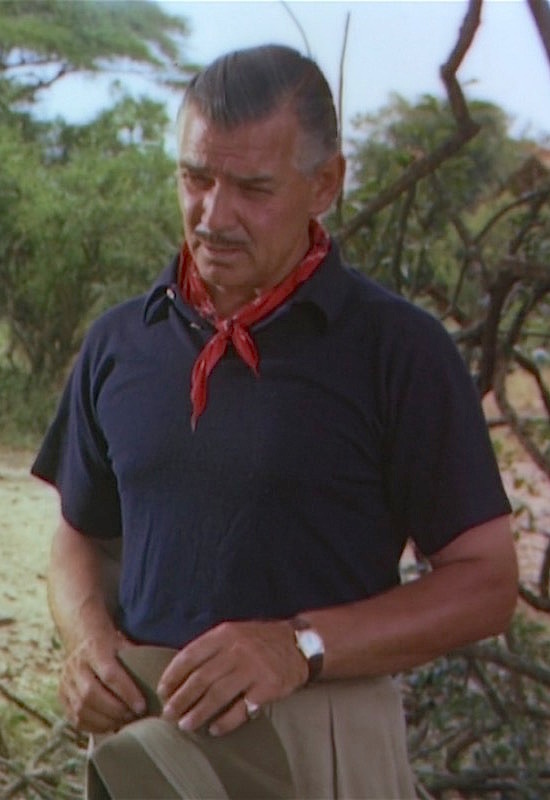 We don’t have time to find out, as Gable’s wrist is adorned for the hunt – and for the rest of the film – with the actor’s own yellow-gold Rolex Oyster Perpetual, ref. 6011. This 14-karat timepiece with its faded off-white matte dial and textured black leather strap was included in a 2013 auction of other Hollywood memorabilia. Victor wears a gold signet ring on his left pinky, a real-life affectation of Clark Gable who wore signet rings exclusively on that finger through most of his professional career. Victor also favors a few different well-worn hats for his adventures on safari. The first hat he dons, for the opening black panther hunt, is a tan safari-style fedora with a thin brown leather band. Later, for the arrival of the Nardleys, Victor wears a more conventional-looking fedora made from khaki felt with a lighter beige band. Victor Marswell is a man who wears many hats… or at least just these two. Mogambo was released in October 1953, several months after the first publication of Ian Fleming’s novel Casino Royale. The novel wouldn’t be adapted into an official James Bond film until more than five decades later when it was Daniel Craig’s cinematic inauguration as agent 007. 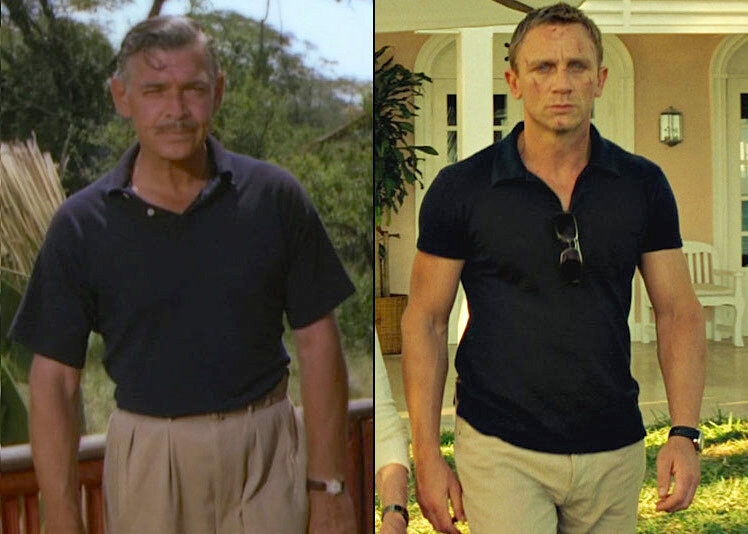 The 2006 film established a fresh direction in casual wear for Bond as the blue polo shirt became a new staple of the agent’s dressed-down wardrobe. In fact, an early scene in Casino Royale finds Craig’s 007 arriving in the Bahamas wearing a navy short-sleeve polo shirt from Sunspel, khaki casual trousers, a brown belt, and brown suede boots. From Clark to Craig: untuck the shirt, clip on a pair of sunglasses, and don’t skip arm day at the gym. The similarities are almost certainly coincidental, but it’s worth noting the timelessness of the dark navy polo shirt, khakis, and brown suede boots on different style icons over the span of a half-century. 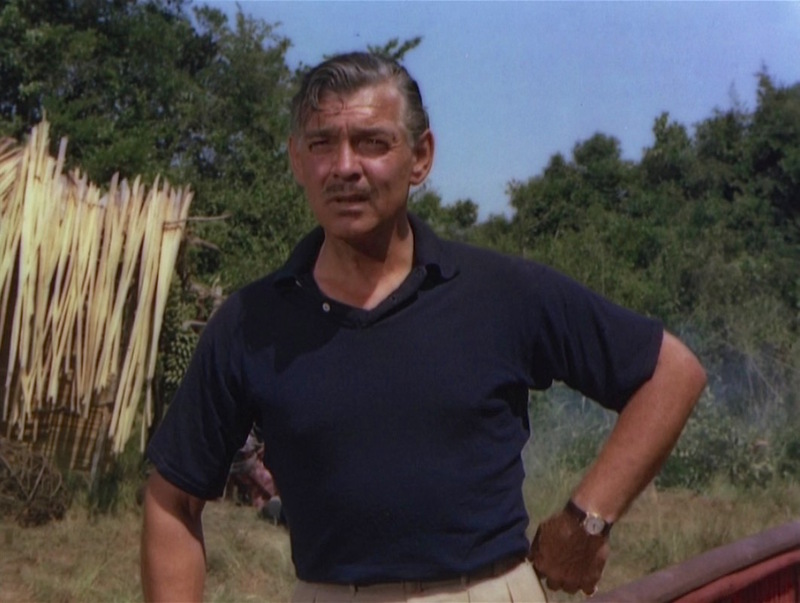 Clark Gable’s no-nonsense hunter in Mogambo takes a classic approach to dressing casually in a navy polo and khakis that keep him casual and cool in his warm, stressful environment. This happens to be my home! Be it ever so humble. 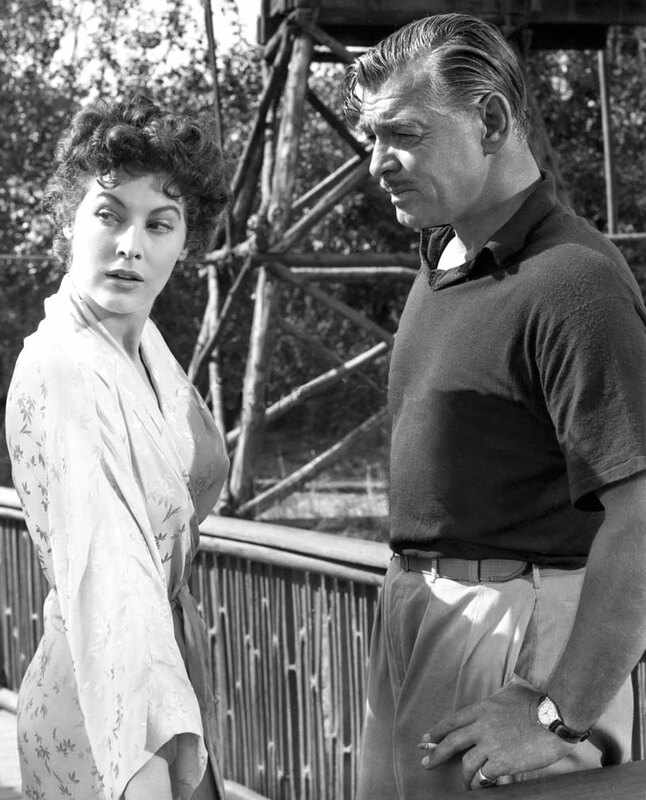 Hmmmm……so you’re mad because Ava Gardner is using your shower?? ?……hmmmmmm…..